PRIVACY STATEMENT FOR THE PURPOSES OF D. LGS. 196/2003 We inform you, pursuant to art. 13 D. 196/2003 that Lgs. 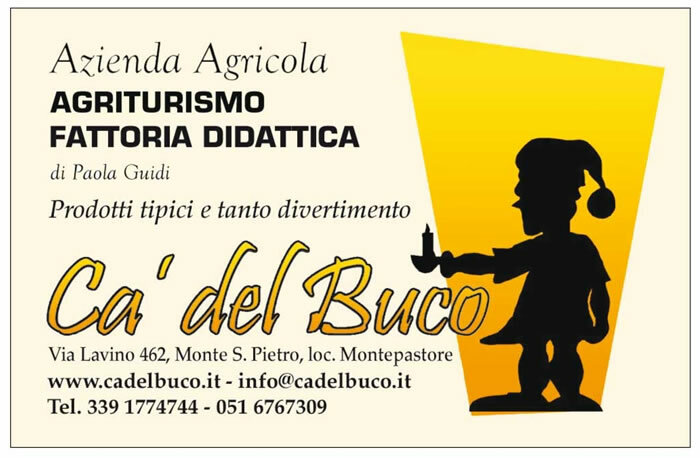 Ca del Buco will proceed to the processing of data submitted by you in respect of the legislation on protection of personal data processing. The communication of data is optional but a refusal to submit them determines the inability to respond to any requests for information. The personal data you provide is collected in telematic ways and treated, even with the help of electronic means, directly and / or through third party representatives (firm delivery) for the following purposes: (1) purposes related to the sending of general information (2) statistical purposes as sending publicity material, also through the use of electronic mail. In any case your data will not be disclosed (if not a society for home delivery) or sold to third parties. Inside Ca del Buco, data may be known only by those specifically charged with operating departments Information Systems, Marketing, Administration and Accounting, Customer Service. According to Art. 7, D. Lgs. 196/2003, you have right to obtain from the person in charge of handling information on the processing of your data, its methods and objectives and the logic attached to it and: (1) confirmation of data and the communication thereof and their origin, (2) the identification of the owner and managers and the persons or classes of persons to whom the data may be communicated or who can learn about them as leaders or appointees, ( 3) updating, rectification and integration of data, (4) the cancellation, transformation into anonymous form, the block of data treated in violation of the law, (5) certification that the operations described in paragraphs 3 and 4 were brought to the attention of those to whom the data have been communicated and disseminated, with the exception of the case in which this requirement proves impossible or involves a use of means manifestly disproportionated in relation to the protected right, (6) object: the processing of data, even if relevant to the purpose of collection, for legitimate reasons, the processing of data for purposes of commercial information or for carrying out market research.